French eighteenth-century luxury goods dealers, or marchands-merciers, designed and commissioned exquisite decorative objects from leading craftsmen for their wealthy clients who demanded the highest standards and constant novelty. Many of these objects were mounted with porcelain. Simon-Philippe Poirier (c. 1720-85) was among the leading marchands-merciers. 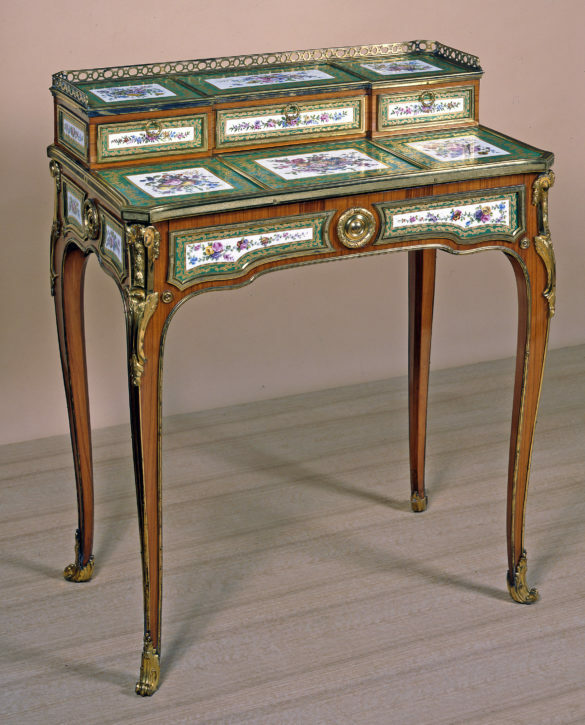 He specialised in creating furniture mounted with porcelain plaques such as this writing desk or bonheur du jour. There are eleven known examples of this model, seven signed by the cabinetmaker Martin Carlin who was born in Germany but who worked in France from 1759. One was bought by Madame du Barry, mistress of Louis XV, for her apartments at Versailles. The date letters on this example on the porcelain show that it was made between 1768 and 1774. This fall-front secrétaire is attributed to the cabinetmaker Adam Weisweiler (1744-1820) who worked for the dealer Dominique Daguerre (d. 1795). It is Daguerre who would have ordered the painted porcelain plaques from the manufactory. With its rectilinear form, the secrétaire is emblematic of the neo-classical style and was created between 1780 and 1783. 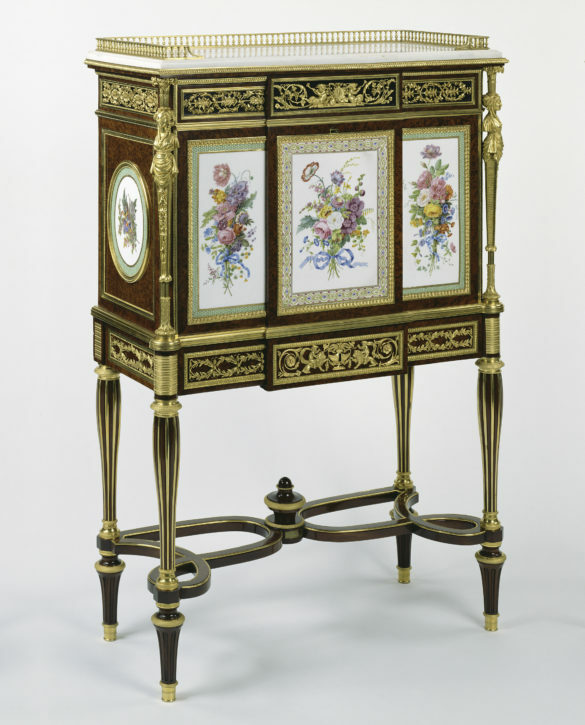 Made of oak veneered with yew burl, mahogany, maple and ebony with drawers of mahogany and juniper, the cabinet is mounted with five soft-paste Sèvres porcelain plaques with a pale green pointillé ground, set in gilt- bronze mounts with a white marble top. 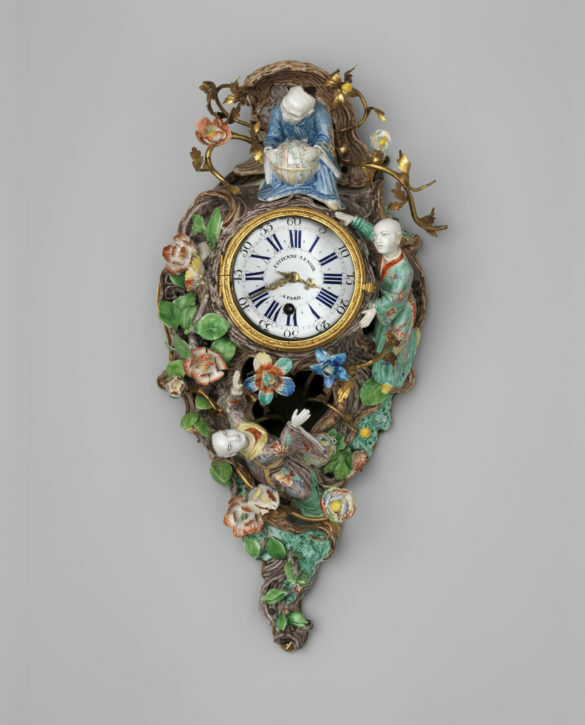 A Parisian marchand-mercier would have coordinated the production of this unusual clock around 1735-40. The case, of soft-paste porcelain, was commissioned from the Chantilly porcelain manufactory, located outside Paris, to fit the clock ordered from the famous Paris workshop of Ėtienne Le Noir (1675-1739). The Chantilly factory specialised in exotic figures (‘magots’) after the fashion for chinoiseries; here, three figures in Oriental costume cavort around the clock, one holding a large globe between his legs. A workshop working in gilt metal (ormolu) mounted the porcelain flowers onto the case. Originally the clock had many more porcelain flowers making it even more decorative than it is today. 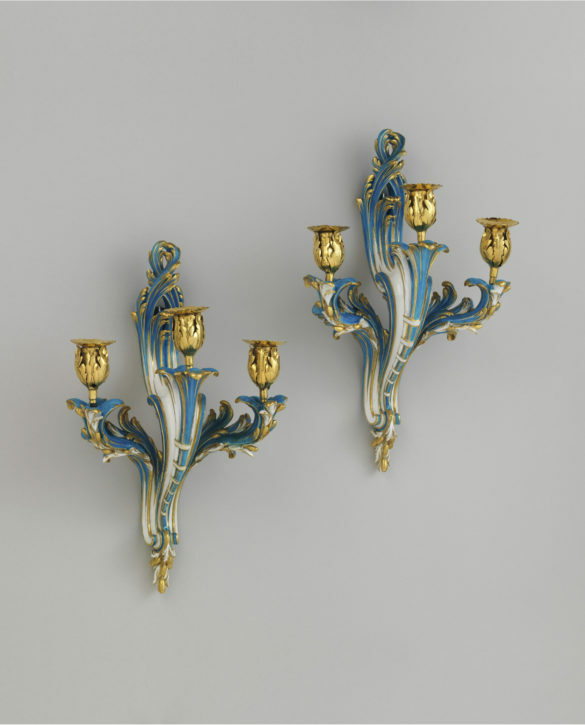 These three-light wall sconces or bras de cheminée are made of Sèvres soft-paste porcelain and gilt bronze. The model is attributed to Jean-Claude Duplessis (c. 1695-74), one of the most innovative designers at the Sèvres manufactory. With their scrolling form, leaves and berries, they are typical of the rococo style at its most exuberant. To make this swirling shape in porcelain was a considerable technical achievement.